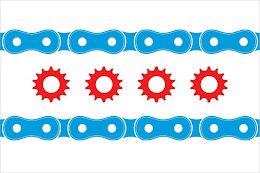 The League of Illinois Bicyclists, a not-for-profit organization dedicated to improving bicycling conditions in Illinois, recently released a list of tips for those who bike in the winter. The League stressed four areas when choosing to ride in the winter: clothing, location, hydration, and maintenance. Warm clothing is obviously of prime importance for winter riding. The League suggests that covering your face from the harsh winds should be the focus of any rider. While layering is also key, making sure your outer layer is both windproof and waterproof should be the rider’s main concern. In terms of location, the League recommends that if a cyclist must ride on slippery pavement, wider tires with many grooves should be placed on the bicycle. Thin tires on slippery surfaces can lead to very dangerous riding conditions. A constant theme whether in spring, summer, fall, or winter is that a cyclist remain hydrated. Insulated water bottles are a cheap but effective way to keep water from freezing and can still be stored on the frame of the bicycle. Finally, due to the harsh and often wet conditions, bicycle maintenance should be preformed after every winter ride. Drying all the moisture from the bicycle will help prevent rusting and keep your bicycle in operating condition. Keating Law Offices advocates the measures proposed by the League but also recommends that cyclists who choose to bike in the winter exercise the utmost caution. While biking at any time of the year can be dangerous, the hazardous winter weather conditions of Chicago pose an extra threat to cyclists. Keating Law Offices is currently handling several cases involving bicyclists struck by negligent drivers. If you have any questions regarding this post or an issue involving Illinois personal injury law, please contact Keating Law Offices at mkeating@keatinglegal.com or 312-239-6787. All e-mails and phone calls are returned promptly. All initial consultations are confidential and free.